Thanks to these two revolutionary digital communication modes, any radio amateur can easily make contacts throughout the world. You don’t need high power or large antennas with JT65 or JT9. Ham radio operators have already used these modes to earn awards such as ARRL’s DX Century Club with nothing more than 5 watts RF output and indoor antennas. Work the World with JT65 and JT9 shows you how to assemble an effective station and configure the software for best performance. You’ll learn how to make contacts, and also how to use these modes as tools to test your station and study HF propagation. Get the facts about JT65 and JT9. Learn how these protocols work and the advantages they offer. Pull together all the hardware and software you’ll need to get on the air with JT65 and JT9. Chances are, you own several items already. Set up your software and start making contacts! Learn how to get the most from JT65 and JT9. 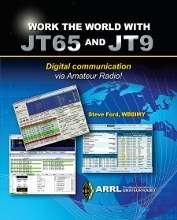 Work the World with JT65 and JT9. Kindle Edition. Copyright: 2015-2017, First edition, second printing.